March, the plowing of the land. Les Très Riches Heures du duc de Berry. The Musée Condé, Chantilly. 1410. The book of hours was a Christian devotional of writings, psalms and prayers, popular in the Middle Ages and intended for use by the laity. The books were usually written in Latin though vernacular forms were not uncommon. The practice of reciting the hours was meant to provide the individual with a more immediate relationship with God and the Virgin Mary. The standard components included a calendar of church feasts, the Hours of the Virgin, the Hours of the Cross, the Hours of the Holy Spirit, the Office for the Dead, and the Suffrages. The canonical hours are distinct intervals of time between the daily prayers. A book of hours contains these prayers. In the Roman and Anglican traditions the canonical hours are also known as 'offices'. In the Eastern Orthodox Church, they are called 'the divine services' and The Books of Hours is called a Horologian (῾Ωρολόγιον). The books varied in decorative content. Simpler versions contained only ornamental letters. More lavish versions, commissioned by wealthy patrons, featured richly executed full page illustrations or miniatures. 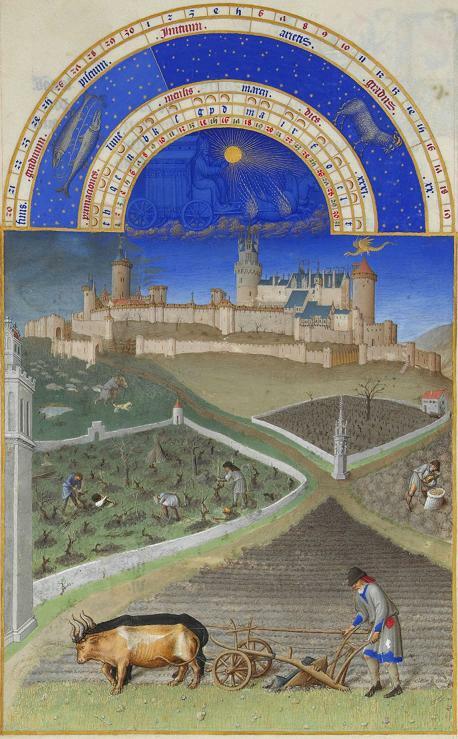 One outstanding example of this manuscript, Les Très Riches Heures (The very rich hours of the Duke of Berry), is possibly the single most valuable book in the world.